On June 3, Guatemala’s Volcano Fuego erupted, spewing lahars (water mixed with volcanic deposits to form destructive debris flow) pyroclastic flows (fast-moving mixtures of gas and volcanic substance), lava and ash that killed at least 114 people and left more than 192 missing. The eruption was one of Fuego’s deadliest in over 100 years. 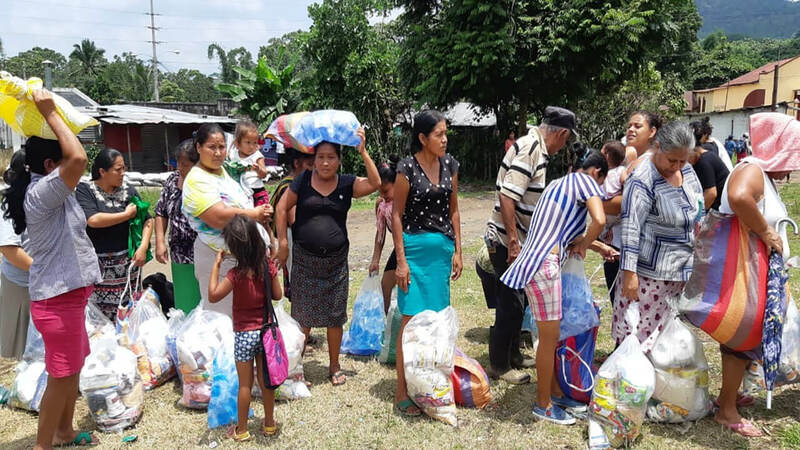 The Assemblies of God of Guatemala’s National Emergency Committee (NEC) immediately leapt into action, receiving and distributing food, water, clothes, medicines, diapers and other supplies directly to some of the areas affected. In the weeks since the eruption, they are focusing on areas mostly overlooked by government efforts, and some nearly were caught up in a hot mud flow while bringing food and water to an affected area. Convoy of Hope sent two representatives who connected with the NEC. They brought water filters, solar powered lights, masks and, to date, have distributed over 52,000 meals to 1,356 families in nine communities. Guatemala’s government has set up several shelters for survivors, and is looking into building simple, basic housing. Many have lost everything: family, home, property and jobs. The government has declared the area uninhabitable. People are not permitted to return to their properties, which are likely buried under ash and mud. Search and recovery efforts for missing people has been called off. CONRED (Guatemala’s emergency agency) continues to issue danger warning of volcanic activity. Continued explosions sending ash into the air continue posing problems to those living downwind. Many are suffering from conjunctivitis, something like pink eye, an irritation or inflammation of the conjunctiva, which covers the white part of the eyeball. Others have respiratory issues and something like bronchitis. Individuals, businesses, and churches in Guatemala have responded with an outpouring of support with donations of food, water, clothes and other needed items for people living in shelters. It is expected that emergency relief donations will quickly be depleted, especially as people’s attention to the disaster dissipates. The Guatemalan Assemblies of God is trying to prepare for when that national response dries up. One Way Guatemala – our ministry focused on outreach and ministry efforts to children 4-14 years of age – is meeting with NEC’s directors to consider longer term compassion ministries to those affected when donations stop. We are also looking to help the NEC with tools and supplies for their workers (transportation, fuel, masks, boots, etc.). The Guatemalan church needs prayer regarding how best to serve hundreds of displaced and hurting people who have lost family, livelihood, property and hope. Join me in praying for comfort, protection, wisdom and provision, and for a mighty testimony of Christ’s love to prevail.